For all the creative people, companies and events that a progressive economic development program brings, in my opinion it’s the outdoor cafe scene that captures the energy and enthusiasm of what it looks like when it all comes together. This week we’ll take a look at the different manifestations of the outdoor cafe scene. This entry’s focus is on the outdoor cafe walk. First of all, a ‘walk’ is a more casual noun that can be given to a pedestrian-only promenade. To illustrate the outdoor cafe walk, it helps to understand the kind of setting it thrives in. Let’s take Beyoglu, Turkey, where the photo above is from. According to a travel site, the area is undergoing a cultural and architectural revival. 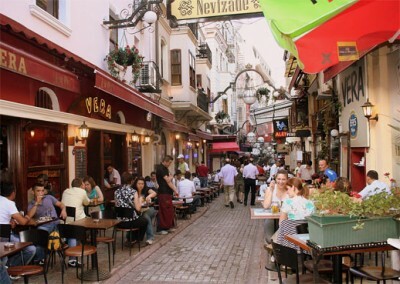 Istiklal Caddesi (the Grande Rue, Independence Street), a popular pedestrian mall filled with people day and night, and its side streets (pictured) is replete with nightlife: cafe-bars, bistros, restaurants and music clubs. It’s the quintessential natural cultural district. – option for a covered walk, especially in rainy and cold-weather regions. Photo: Nevizade Tavernas, Galatasaray, Beyoglu, Istanbul, Turkey. See the full-sized photo (it’s worth it) here.